TOKYO and PLEASANTON, CA--(Marketwire - October 28, 2009) - Polycom, Inc. (NASDAQ: PLCM), the global leader in telepresence, video, and voice communications solutions, today announced a leading global food manufacturer, The Mizkan Group (Handa City, Aichi, Japan), has deployed Polycom high-definition (HD) room telepresence solutions across its key sites worldwide. Subsequently, The Mizkan Group has been able to realize rapid and substantial travel cost savings and considerable improvements in business effectiveness. The Mizkan Group has deployed Polycom HDX series room telepresence solutions at its headquarters and 13 domestic branch offices, as well as in its strategic international offices in the U.S., U.K. and China. 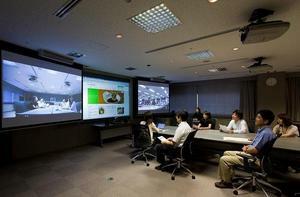 The company has been able to achieve significant market advantage -- and match the responsiveness of competitors based in larger Japanese cities -- by utilizing these Polycom telepresence solutions with content-sharing capability to support a variety of business applications; including meetings amongst managers located in different offices of The Mizkan Group worldwide, meetings amongst domestic branch offices, and planning sessions with external agencies. More than 1,000 employees of The Mizkan Group have used Polycom telepresence solutions to easily and effectively meet face-to-face, without the need for travel. As a result, The Mizkan Group has been able to substantially reduce its travel costs. Additionally, because Polycom telepresence solutions create a life-like experience that provides a viable alternative to travel, The Mizkan Group has been able to increase its preparedness for pandemics and other potential interruptions to business continuity. Hiroshi Masuda, Manager, Information Planning Section, Management Information Systems Department, at Mizkan Busitec commented, "By improving work efficiency using Polycom video solutions, The Mizkan Group has been able to realize tangible benefits in productivity and business competitiveness. Reducing the need for travel also ensures our teams have the opportunity to spend more time with their families, promoting an improved work-life balance." Mizkan Busitec manages the IT infrastructure operations of The Mizkan Group. When evaluating visual communication solutions, The Mizkan Group trialed and compared systems from multiple vendors. The Polycom room telepresence solutions were chosen because they uniquely combine HD video and HD voice capabilities to deliver a virtual meeting experience that is just like having all participants situated in the same room. The availability of Polycom's global support was also highly valued given The Mizkan Group's strategy to expand abroad. Polycom partner, Princeton Technology, was responsible for managing the deployment process, from model selection and proposal, to network design. As a result, the Polycom telepresence solutions were smoothly and efficiently implemented across The Mizkan Group's global sites within 12 months. Going forward, The Mizkan Group plans to also regularly use Polycom telepresence for purposes such as real-time executive communications to employees and briefings on new products. The Mizkan Group is a 200-year old privately held leading food manufacturer, based in Handa City, Japan. The Mizkan Group has a stable of well known international brands, under the "mizkan" umbrella brand and is a leader in the liquid condiment category. The Mizkan Group has operating facilities around the globe, including Japan, China, the United Kingdom, the United States, Thailand, Singapore, Hong Kong & Taiwan.